The Catholic Jedi Academy: Empire State Building Protest, Here We Come! Tomorrow I'm heading over to the protest at the Empire State Building with my nephew and my dad, along with a busload of others from Chaminade High School in Mineola, Long Island. This is to protest the refusal to light the building in honor of Mother Teresa's 100th birthday. It seems like such a dumb p.r. move, as well as just a petty attitude. And, interestingly since the refusal to honor Mother Teresa the building has come down with a case of bedbug infestation. Coincidence? Pestilence?? Hmmm. The protest is being spearheaded by Bill Donohue and the Catholic League. My nephew is very involved with the Catholic League at Chaminade. It's great how the students at the high school level throw their time and energy into supporting worthwhile causes and being a public witness to the Catholic faith. It certainly is an encouragement to the rest of us. I'll post some pictures tomorrow. It should be a great turnout in honor of one of the bright lights of our age. As some argue, Mother Teresa certainly doesn't need the tribute to bolster her image, but if the Empire State Building can turn on the lights in honor of the bloody Communist Chinese revolution, they can certainly turn them on for someone who poured out her life for the sick, poor and dying. 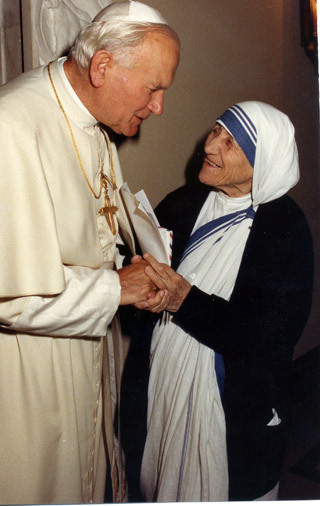 Well, in any event, we'll be there to give Mother Teresa the tribute she so richly deserves. If you're in Manhattan come on down at 6 p.m.